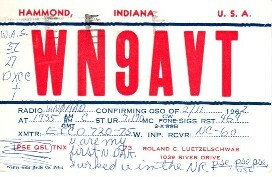 I was issued my Novice call WN9AVT on October 11, 1961. I started as many others of the era did - as an SWL (short wave listener), and was “licensed” by Popular Electronics as WPE9BQH. My first receiver was a National NC-60 Special that Mom and Dad bought for me in 5th grade. Through two books in grade school (SOS at Midnight and The Short-Wave Mystery in the Hardy Boys series), I became aware of Amateur Radio and used my NC-60 to listen in on 160m operators participating in the nightly Calumet Area Emergency Net (Chicago and northwest Indiana). My SWLing efforts continued through 6th grade and into junior high school (7th and 8th grade). My Social Studies teacher in junior high was W9MNO. Through W9MNO’s radio club at school, I received my Novice license. I used the article “A Complete Novice Ham Station” in the September 1960 issue of Electronics Illustrated to study for my Novice exam. My NC-60 receiver served me well during my 8 month Novice career. Using the old CHU frequency of 7335 KHz as a reference for the main tuning dial, I calibrated the bandspread dial for the 40m band (my workhorse band as a Novice) on a taped-on piece of paper. This allowed me to reasonably find other frequencies for skeds with other Novices (who, of course, were also crystal-controlled).